for quite some time and the wall is almost empty. or rather its assigned spot. Henri Loyrette’s statement in which he very seriously explains that the works will not be leaving the Louvre since Lens, from now on, is the Louvre , does not worry us as much as the total lack of reaction it produced when it means simply that he thinks people are dim-witted. Thanks to these two interviews, we also learn that the works will be taken down at the Louvre in September (contradicting the information provided by Xavier Dectot in La Voix du Nord who says the operation will start in August !) in order to hold the inauguration in December, extending the period during which these works will be away. 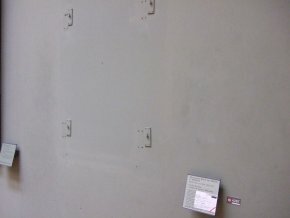 Another bit of news is that "care will be taken to fill the gaps, to rehang certain rooms, so that there are no holes." This would indeed be an achievement ! At the moment, there are already holes (ill. 1 and 2) even though Lens, or even Abou Dhabi, have not yet opened ! In fact, the situation has improved slightly as compared to previous years, where it was particularly disastrous notably in the rooms devoted to Northern European painting (ill. 3 and 4). 3. Wall in the 17th century Dutch painting rooms. is currently being exhibited in Japan. 4. Bosch’s Ship of Fools is also missing. 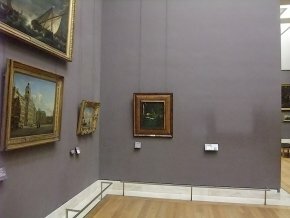 "Rencontres, le groupe dans les collections du Louvre " or "Meetings, Groups in the Louvre collections" ; "Les Arts et la vie " ; "The Collection of the Kings " ; "Visages du Louvre " ; "Léonard, Raphaël, Rembrandt et les autres. Portraits et figures ", etc. In the past several years, the Louvre has exported several exhibitions whose lack of intellectual content can be seen in the titles. The one which is to inaugurate the Louvre-Lens continues this now sad trend. It is entitled "La Renaissance". In which countries ? Italy, Flanders, Spain, France, all of Europe ? What time period ? The 15th century ? The 16th century ? All of the Renaissance, in all of Europe ? That is, over two centuries of European art ? Grasp all, lose all. How is it possible to sum up the Renaissance in one exhibition ? But of course, there had to be some argument to justify shipping Leonardo’s Saint Anne, which has been programmed for Lens since 2006. Fortunately, the Louvre in Paris continues to offer fine scholarly exhibitions as, for example, the exceptional retrospective on, precisely, the recently restored Sainte Anne which we will soon discuss here. This is highly commendable but its policy of assigning hangs to the provinces with the sole ambition of lining up artistic works  leads us to think that museum management feels the inhabitants of Lens are not capable of understanding something a little more demanding intellectually. The Louvre-Lens is a bit like the Centre Pompidou mobile : the rich Parisian bourgeois handing out alms to his poor provincial cousins. For more information concerning the reasons against this entreprise, in our opinion, readers may consult this article, in French. 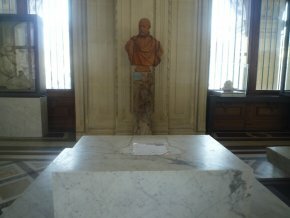 "Elles ne quittent pas l’institution nationale qu’est le Louvre ! 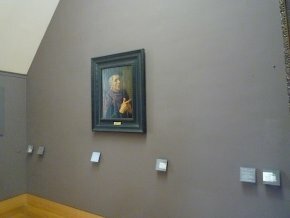 Désormais, le Louvre est autant à Lens qu’à Paris" he proudly states in the interview granted to Le Figaro. This is the final name for the Louvre exhibition in Fukushima which, originally, was entitled : "Rencontre, Amour, Amitié, Solidarité dans les collections du Louvre". Title of the Quebec exhibition in 2008. Title of the first Louvre exhibition in Atlanta, whose trailer we find comically Rambo-like. The purpose of this exhibition was to "please" Bernadette Chirac (see here). This paying-rental exhibition was to be organized in Verona (see article). Fortunately, it was finally cancelled. These take up an inordinate amount of curators’ time.